Valentine Day Is Very Special For Lover And Friends. Because All Is Waiting For Propose Girl Friends And Boy Friends.IF You Are Going To Do This Valentine Day Special And Memorable With Loving Friend .This Article Help You For Doing Very Interesting For Your Friend. 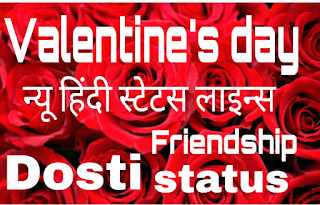 Check Awesome Hindi Valentine Day Status For Better Response. I Am Making All Lines Very heart Touching With Shayari. तन्हा रहूँगा.. फिर भी तेरा ही रहूँगा....! बेपनाह इश्क़ करने की ख्वाहिश उम्र भर रहेगी. अगर आँख खुली तो उठा देना और नहीं खुली तो दफना देना !! यह दुनिया भी आपकी मुस्कराहट के नाम करते हैँ..
और तुम गले लगा के कहो, �और कुछ ? पहले मैं .. कुछ .. बनना .. चाहता था ..
लेकिन अब .. मुझे बस ... सिर्फ तेरा .. बनना है .. 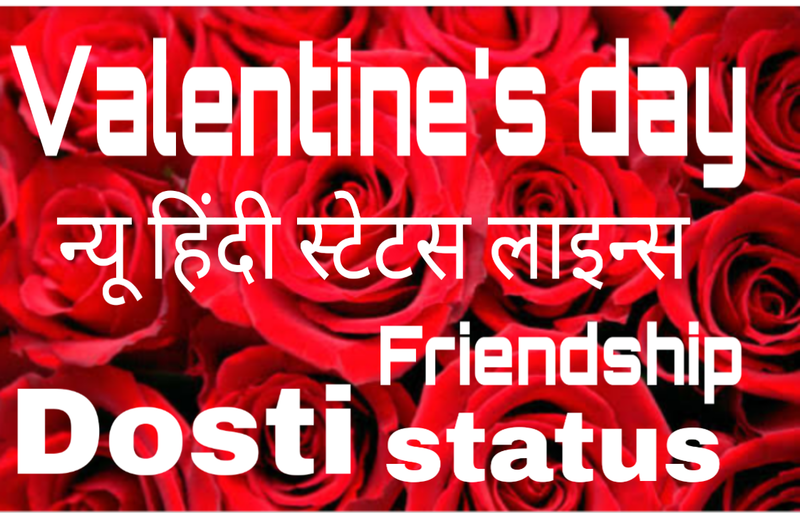 Thanks For Sharing Hindi Love Valentine Day Status For Your Friends. I Hope You Like All Status In This Category And Share With Whatsapp and Facebook .